We are teasing of course. Nevertheless it continues to amaze that even in 2013 you can throw a selection of regular household chemicals together and discover completely new chemistry. Take Lindsay J. Hounjet et al. here (Stephan and Grimme accounted for) who in a brainwave combined Tris(pentafluorophenyl)boron, diethylether and hydrogen gas. Well, not exactly hydrogen gas but HD gas which allowed them to ascertain (by NMR experiment) that hydrogen exchange was taking place. And if you say hydrogen exchange you say hydrogenation. And yes, the combination of B(C6F5)3, Et2O, CD2Cl2 and H2 and anthracene results in hydrogenation. The key frustrated Lewis pair in play here is (Et2O)2H+ H(B(C6F5)3)-. Humble ether ripping apart dihydrogen with a little help from a friend. I dare you: take the Sigma-Aldrich catalogue, select any combination of chemicals on stock and discover new chemistry worthy of publication from a single reaction. Difficult? Lindsay J. Hounjet thinks not. Is it possible to synthesise a cluster with exactly 12 platinum atoms and why would you bother? Masaki Takahashi explains here! Start from tetrakis-(4-aminophenyl)methane. Use as core for dendrimer synthesis with layers of benzophenone and then titanium chloride and DABCO in chlorobenzene. Stop at generation 4. This phenylazomethine dendrimer has exactly 12 imine groups to be used as Pt anchors. Form (PtCl4)12@TPM G4 by adding platinum chloride. Form (Pt)12@TPM G4 by sodium borohydride reduction. Evidence thereof is lacking but we are led to believe the Pt cluster does not leave its dendrimer. Then add a suspension graphitized mesoporous carbon (GMC) for the (Pt)12@TPM G4 to stick to. And now to the "Why bother" part. The new compound was tested as a hydrogenation catalyst with substrate styrene at 25°C and 1 atm of hydrogen. Compared to regular Pt@GMC (large Pt particles, no dendrimer) the turnover number is larger by one order of magnitude!. The Netherlands today experienced a novel approach to citizen science with over 5000 participants who did a quick scan of local atmospheric dust levels (particulates) with just a smartphone, an app and a small set-up piece . The results of the scan were already in this evening (Link). So how did the measurement work? The set-up piece was placed in front of the camera. A slit sits in front followed by a quarter-wave plate, a multi-order wave plate, a polarizer and a diffraction grating. The participants pointed the device at the blue sky and took photos at different angles. Back in HQ dust levels were calculated from the visible spectrum and the degree of polarization of this spectrum that the photos produced. The same principle by the way is used in SPEX for the measurement of dust and clouds in the atmosphere of the planets in our solar system. The end result is a map of the Netherlands dotted with 5000 data points with each point a dirty brown for polluted air or a healthy blue for clear air (we are generalizing) and everything in between. The map does not immediately makes sense. You would expect to see oceans of blue outside the major cities but it does not work that way. Someone took a measurement almost in front of my house and it is an ugly brown! Must be the heavy road reconstruction work taking place in the next street? I hope so. This blog first learned about Leroy Cronin from a TED talk he presented on printing molecules here. This talk was flawed because the impression was given that you can actually print molecules. A recent article from the Cronin lab in Chemical Science here should give a nice opportunity to find out what really gets printed in the Cronin lab. In it Kitson et al. describe performing a series of consecutive conventional organic reactions (DA cyclisation, imine formation and hydrogenation) not done in the classical way of batch production (glass or steel reactors) or even via flow chemistry (plastic or steel tubing). The "reactionware" that is central to the innovation are collections of reaction chamber cubicles designed by computer and 3D-printed. Each cubicle encloses a custom designed reactor optionally with a custom catalytic surface or custom chromatographic channel. Tandem reaction are made possible by locking cubicles together with the inlet and outlet ports and letting gravity do all the work. The process is more complicated though than it sounds: the printing process has to be interrupted (take 12 hours for curing to finish) when it comes to filling the reactor with chemicals or even adding a stirring bar. Nevertheless, yields from the reactionware sequence compare well with yields from the conventional methods. There are some annoyances. What type of material is a cube made of? The article is not at all clear: it says it is printed from polypropylene, but how? The supplementary info mentions extrusion. But is extrusion also 3D printing? Think not. The raw material list mentions an acetoxy-silicone polymer (LOCTITE 5366), a material that can be UV cured but is certainly not polypropylene. Is it a polypropylene-like material? The description acetone-silicone polymer is not at all scientific. This blog eventually had to give up, the reactor walls are fuzzy. Another annoyance. A 2012 article from the same group in Nature Chemistry (DOI) and another 2012 article (DOI) all describe a similar experiment but with a different chemical reaction. If we consider everything mankind have come up with in terms of organic reactions and their combinations we are going to enjoy a long string of Cronin reactionware articles. By the way, the novel concept is sold as an opportunity "where chemistry can be performed (...) in places where there is no laboratory apparatus and by people who have no detailed knowledge of liquid handling in chemistry". We can be certain the Jesse Pinkmans of this world have taken notice. Downsides: reaction requires 4 eq. of MCDFA and stochiometric copper. MCDFA invites multiple alkylations on initial CF3 unit, resulting in polymeric mess. CF3- possibly in equilibrium with difluorocarbene, stoichiometric copper drives equilibrium back to desired end. 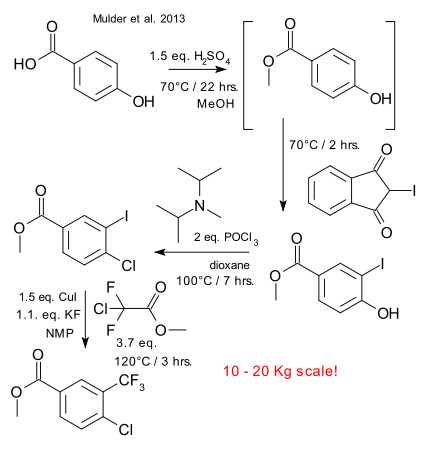 Foam formation from carbon dioxide was also found to interfere with kilogram scale batch production.